Around 30,000 Jewish men were imprisoned in Buchenwald, Sachsenhausen, and Dachau during November 1938. 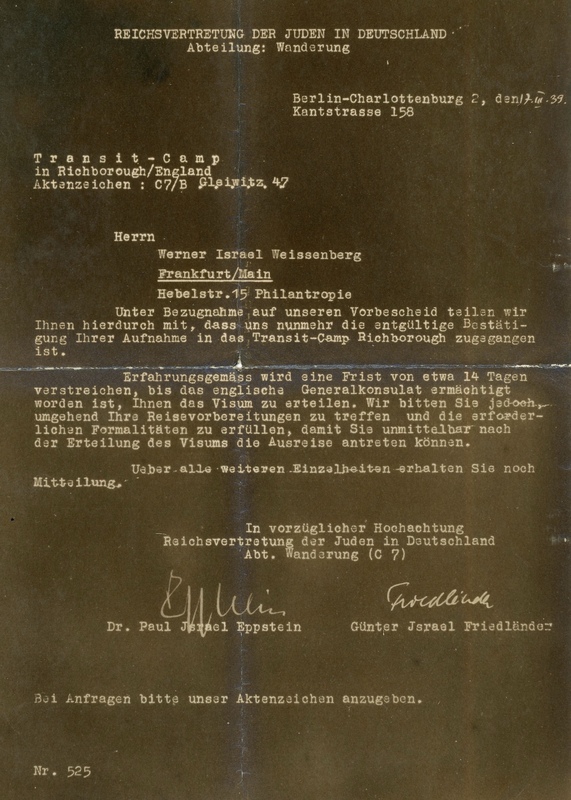 When Werner Weissenberg was incarcerated in Dachau during the ‘November Terror’ (sometimes still referred to as Kristallnacht), his family were frantically trying to get him out, as all such families were. 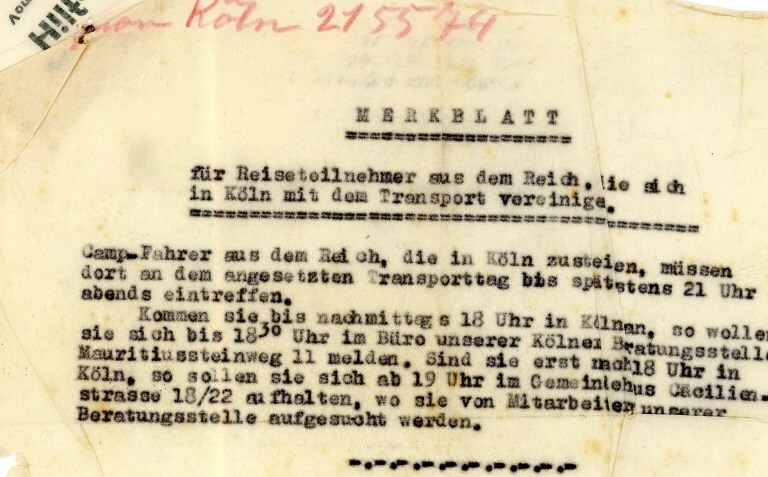 The families had to pay sums of money to obtain their sons’ and husbands’ release, but the men also had to undertake to leave Germany quickly. Until they left, they had to report to a police station weekly and remained at risk of re-arrest, which would have meant almost certain death. With reference to our discussion I am informing you that your acceptance by the Transit Camp Richborough has been confirmed. There will be an interlude of 14 days before the English Consul is empowered to issue the visa. However, we request that you make all your preparations for your travel and complete all formalities so that you are ready to commence your journey as soon as you receive your visa. You will receive further details about all your particulars forthwith. 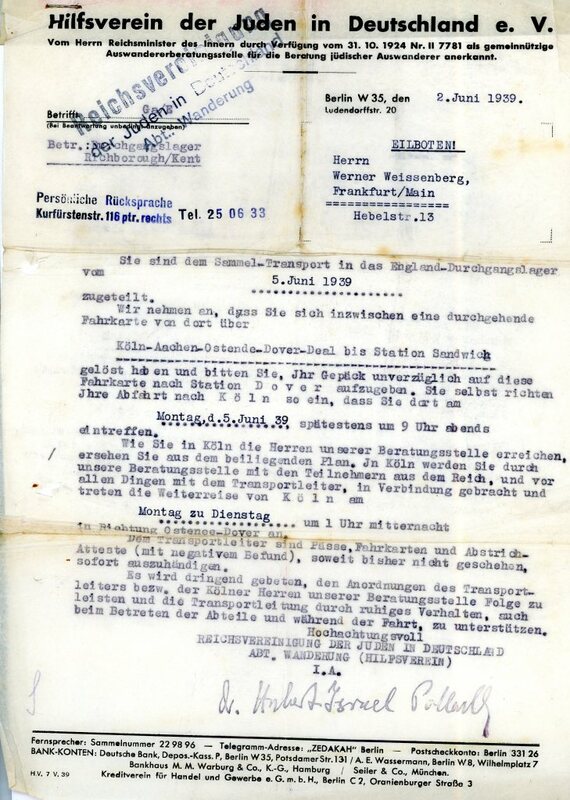 You have been allocated a place on the transport to the transit camp in England on the 5th June 1939. Monday, 5th June 39 at nine o’clock in the evening. You will see from the enclosed plan how you can contact our advice centre. In Cologne you will be put in touch with the help of the advice centre with the participants from the country and above all with the organisers of the transport. You will continue the journey from Cologne at 1 o’clock at night in the direction of Ostend Dover. You have to hand over tickets, passports and certificates to the organisers. We would urgently request you to obey all instructions given by the Cologne advisors and to support the organisers by behaving respectfully at all times during your journey and give them your support. For travellers out of the country who are joining the transport in Cologne. Travellers out of the country to the camp who are joining the group in Cologne on the appointed day must meet at the latest at 21.00 hours in the evening. In case you arrive in Cologne in the afternoon before 18.00 hours you can announce your arrival at our advice office in Cologne until 18.30. Mauitiussteinweg 11. If you arrive in the Community Centre Cacilienstreet 18/22 from 19 hours, where the advisors will meet you. Not knowing this connection, when we started this project, Felix’s grandson got in touch to say his grandfather had been in Kitchener when he first arrived in Britain. As I started to reply to his family history, I suddenly realised – this was ‘Felix of the ORT’, about whom we had long wondered! Our news is more scarce. Your letter of the 7th March arrived but looked as if it had been written in haste. Are you short of time? I have so many questions and don’t receive many answers. The questions I asked eight weeks ago have still not been answered properly; only that something was happening. 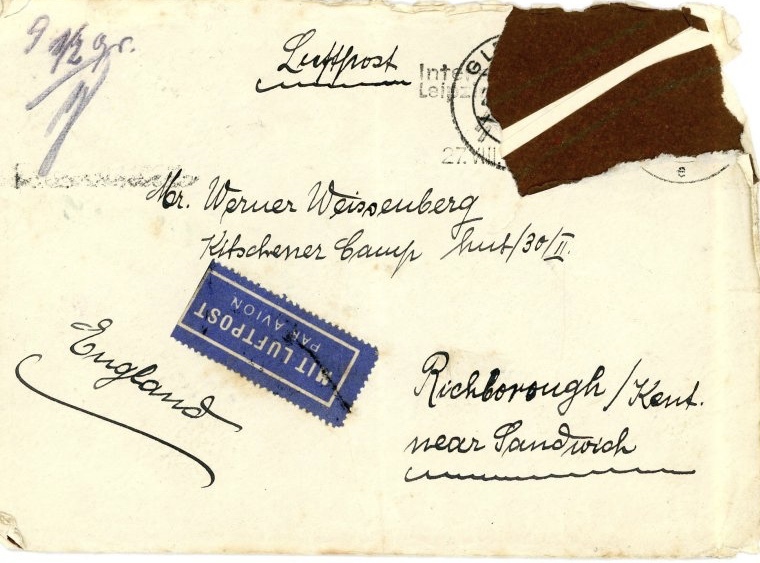 Maybe there was something mentioned in the letter I sent to your friend Ettlinger on the 17th February. Anyway, I am happy about your circumstances and hope they remain that way. As far as we are concerned I had a bad shock, because Grandmother suffered two strokes. 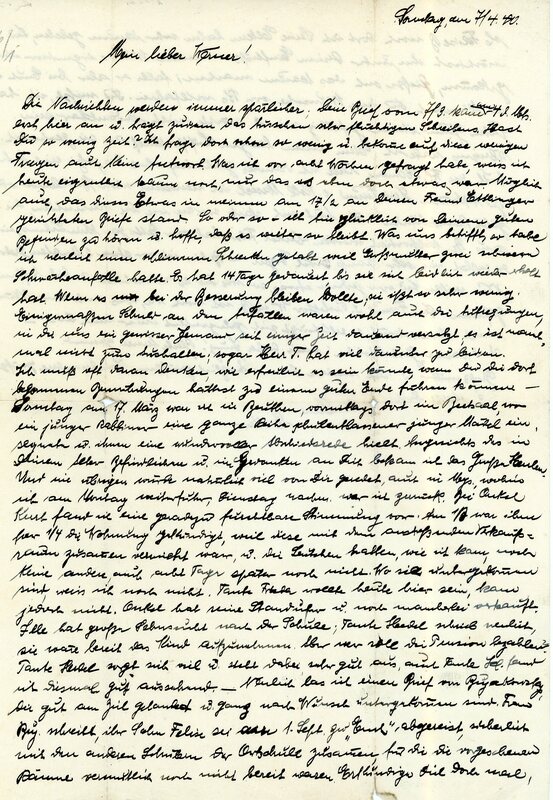 It took two weeks for her to recover slightly; the stress we have been under for some time now is affecting us – we cannot bear the constant moving – even Herr T has to submit to it. It is undoubtedly the cause of her strokes. She isn’t eating much – she would be better more quickly if she ate. I often think how nice it would be if you had results for your efforts, it would have such a happy ending. On Sunday 17th March I was in Beuthen in the morning. There in the prayer hall there was a very young rabbi; there was a lovely leaving service and sermon for a school girl. I burst into tears because he read parts of your text. Obviously there was much to talk about, also in Moys where I travelled on Monday. By Tuesday I was back. Your Uncle Kurt was in a terrible mood. From the 1st March he was made to give up a quarter of his flat, because the forthcoming sale will take place, it is connected to it. Eight days since the sale, they haven’t found any alternative. I don’t know where they found any place to live. Aunt Freida was to have come here today but she is unable to. Uncle has sold many items. Elle misses school very much. Aunt Hedel wrote recently that she was prepared to look after the child, but who is going to pay the board and lodging? Aunt Hedel is really caring and looks quite well. Recently I read a letter from the Bujakowskys, they have found somewhere, just where they wanted to. 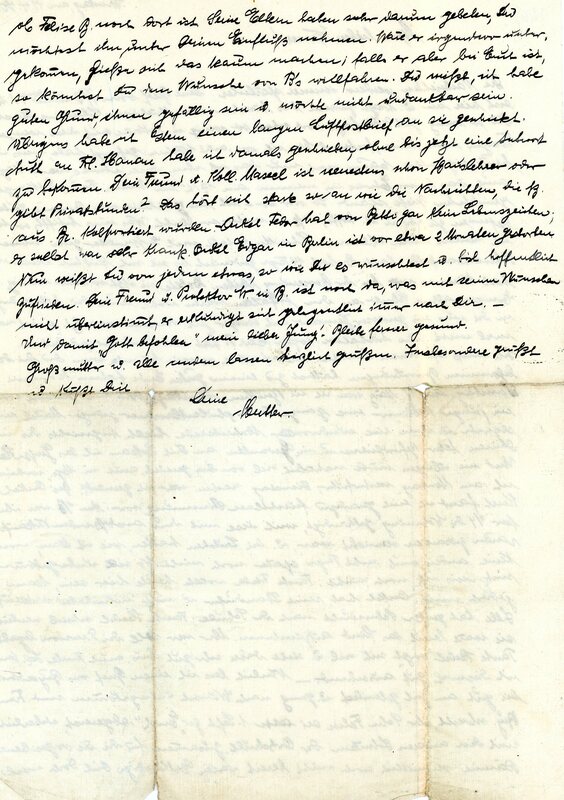 Frau Buj writes that her son Felix left on 1st September to be with you, probably temporarily, to the O.R.T school! The rooms were not quite ready for all the pupils. Find out about him, because his parents were very concerned that he could thrive under your influence; if he has found shelter elsewhere this will not be possible, but if he is with you the B’s wish could be granted. Incidentally, I sent a long airmail letter to them yesterday. I wrote to Fräulein Hanau as well, but I haven’t received a reply. Is your friend and colleague a teacher or is he giving private lessons Marcel? The news I get from B – Uncle Fedor has not received any sign of life from Beth; he has himself been very ill. Uncle Edgar in Berlin died two months ago. Now you know something about all of them, just as you wanted and I hope you are satisfied. Your friend and guardian with B is still there and sometimes asks about you, although I don’t agree with her views and bless you, my dear boy. Stay heathy. Much love from Grandma and all the others.